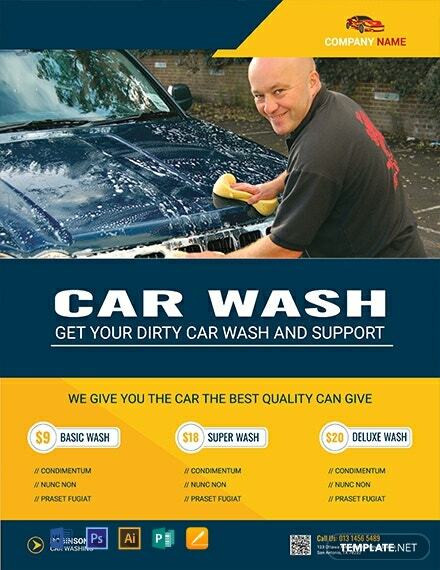 Make sure your car wash business stands above the rest by producing amazing flyers to promote your business that's irresistible to drivers with dirty cars! 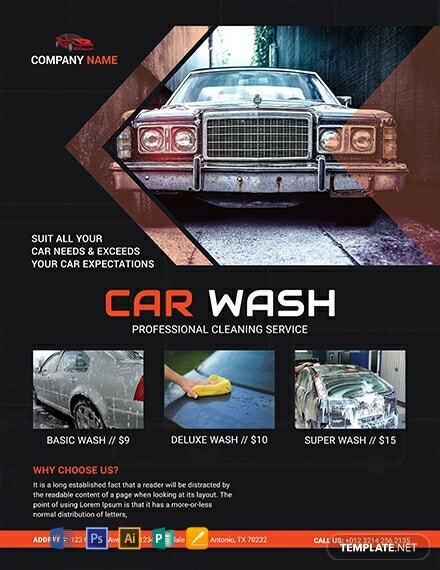 Download from our wide variety of content and choose the perfect car wash flyer template. These files are ready-made and easy to use. They are professionally designed and makes use of high-quality layout, artwork, images, text and graphic files. Available in tri-fold and bi-fold. Print ready, perfect for commercial as well as personal printing. Save the downloaded file on your PC or mobile device. Easily editable and can be opened in all versions of Adobe Photoshop (psd), Illustrator (.ai), Indesign, Microsoft Word (.doc), Publisher, Apple Pages, Mac and Google Docs. Setting up a car wash service business in comparison to other more complicated businesses is probably one of the easiest to start up. At the same time, it can also be the riskiest in terms of stability and one of the businesses more likely to close as fast as it was opened if not managed properly. 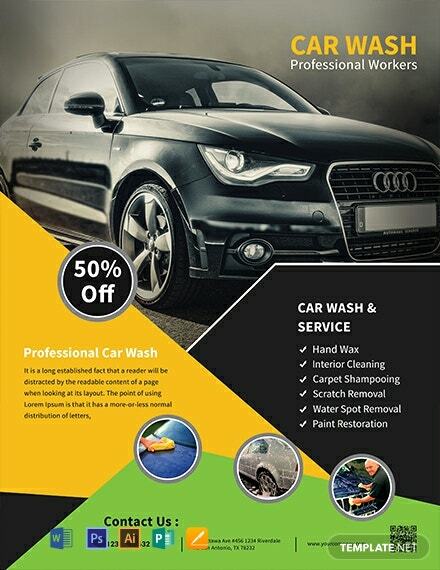 Car wash flyers, car wash posters, or car wash banners play a huge role in marketing any car wash business as flyers are one of the most cost effective ways to market any product or service. Important text or messages such as discounts or free items must be in big fonts and emphasized. If at all possible, it should be readable from a distance. 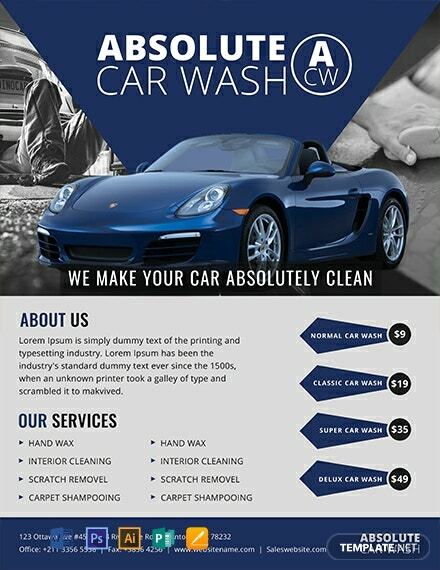 For ready made and effective flyer design examples that are fully customizable and print ready, use only car wash flyer templates from Template.net. 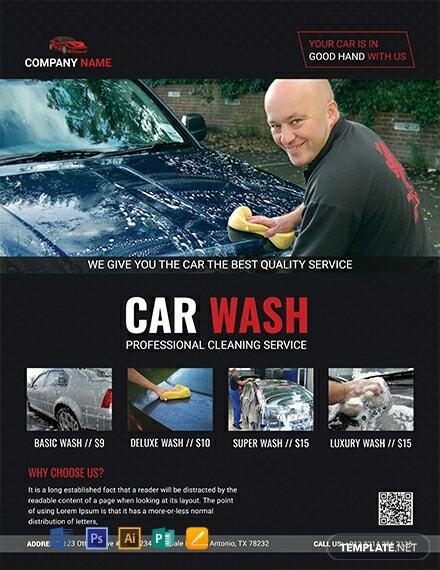 Make use of appealing photos or pictures of neat, clean, and shiny vehicles. 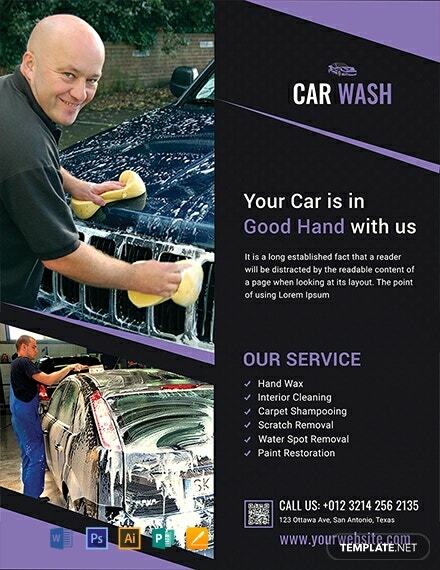 This increases the appeal of your car wash business. Another idea would be to show your model employee doing about his business in a very efficient manner. With designer quality flyer templates, Template.net offers easily downloadable and highly editable flyers printable upon download. 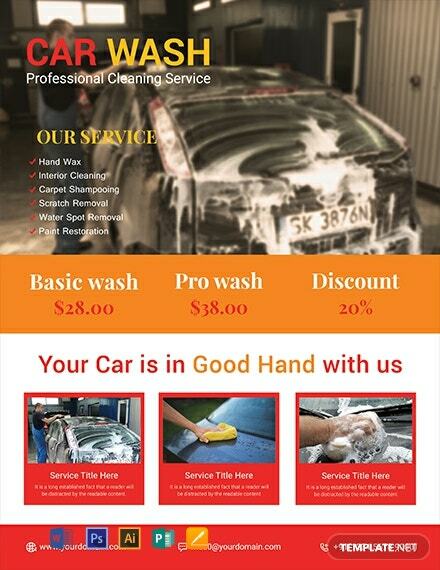 Too much design can be distracting to the message of your flyer. You can additionally include a list template to enumerate different benefits or discounts you are giving out. Act now and get guaranteed results by using flyer templates from the site. Control the use of text as it may crowd your flyer. Use and show only what is necessary. Make sure to always include your contact person along with contact details so readers have actionable information. 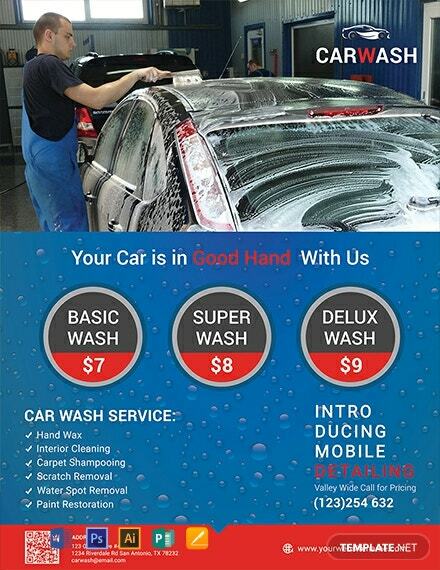 Getting the right combination of text and images make for an effective and well designed car wash flyer. Minimize costly mistakes by using ready made templates available instantly from Template.net. Each template have beautiful and creative designs that are easily editable without any designer. 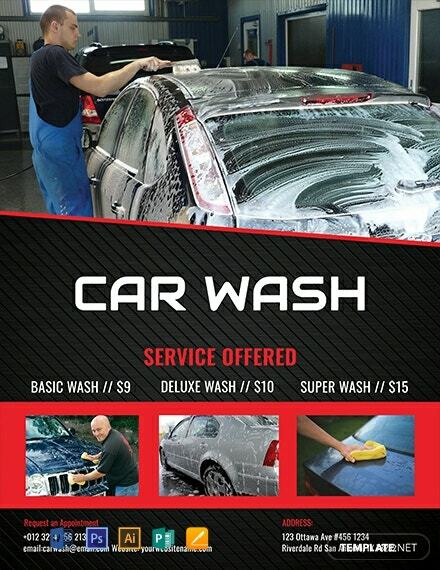 Grow your business by saving time and money over the design of a car wash flyer. Simply head over to the site and download any file or template at lightning fast speeds. Add your necessary information and your work is done in minutes. Get the right strategy for your business while using templates from Template.net. 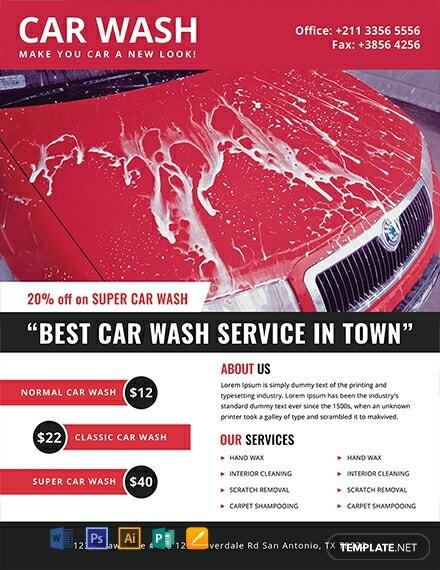 Grab this opportunity of getting your hands on amazingly useful and effective templates that will help propel your car wash business to the top.